When in Prague, thou shall eat sausage and drink beer! 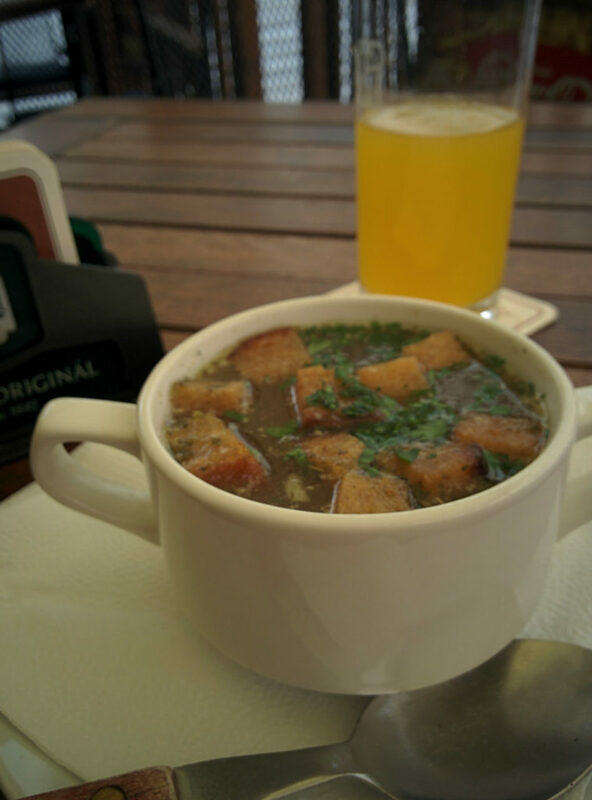 I went to the Czech for the weekend and ate my way through Prague! 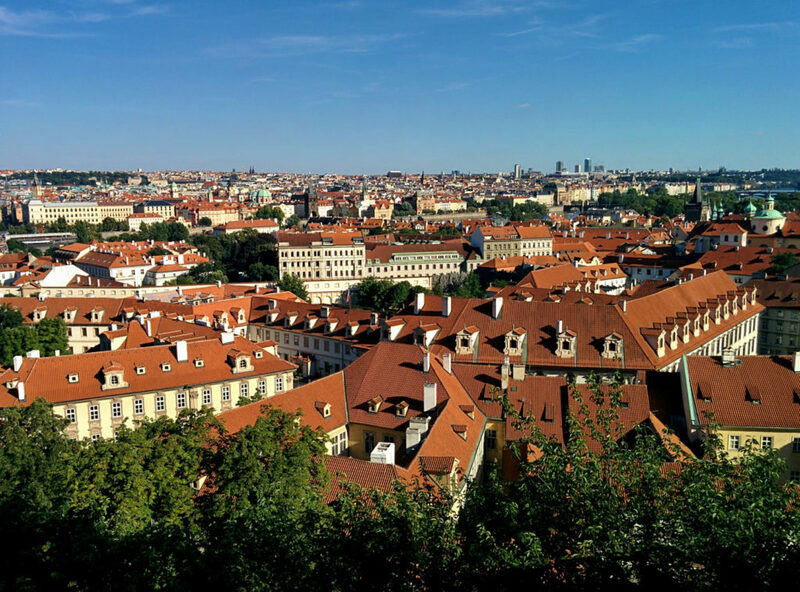 Before I went, I got some tips from friends who have lived in Prague. So I was set with a big to-do list for all the local goodies! 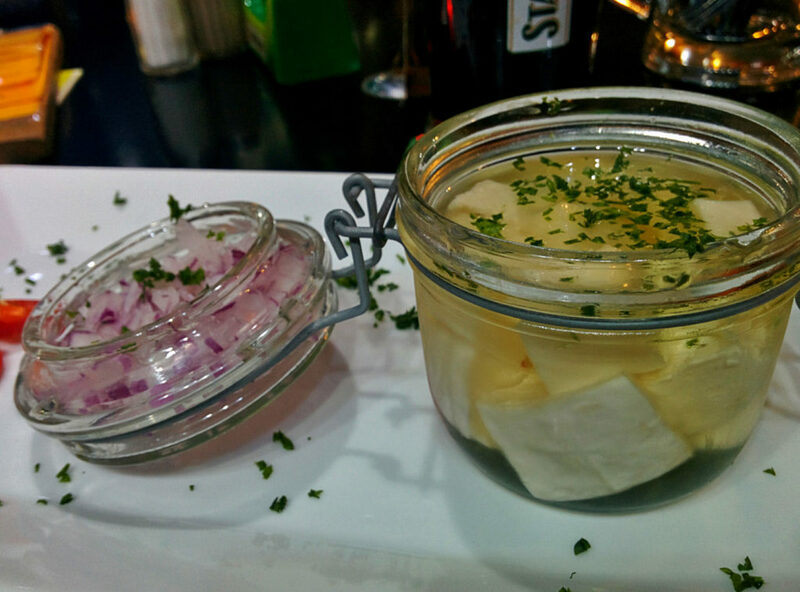 Turns out most Czech foods are rather heavy, but they also really know how to prepare some tasty treats over there! With beer and sausage at every corner a fellow German like me felt home immediately. The Czech republic is mostly known for their beer and sausage by a lot of people, so obviously that was my first stop when I arrived. 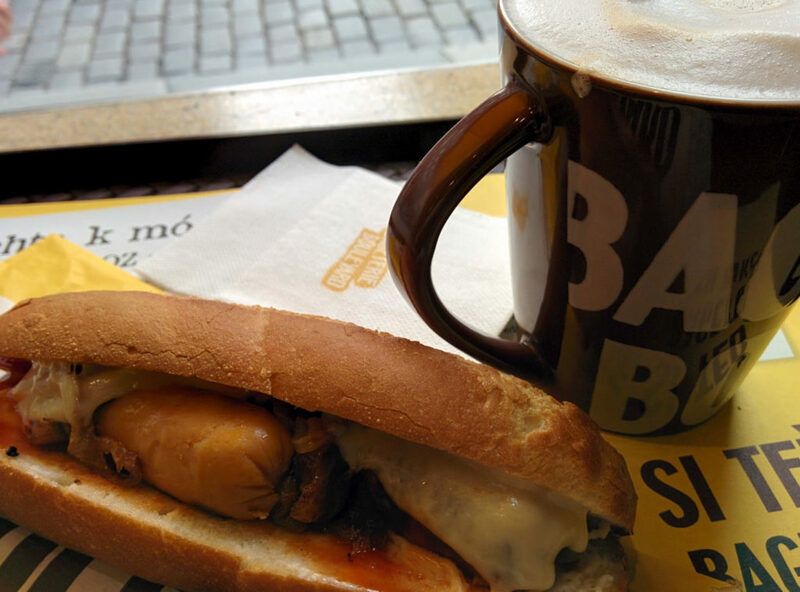 A traditional garlicky Prague sausage bought on Wenceslas square served on a toasted bun with loads of mustard! The dog had a really nice snap to it. Immediately I knew I’d like my stay! After dumping my bags at the hostel I went out to a pub crawl. I met quite some funny people along the way and ended up with some Australians in Europe’s biggest night clubs. After a long night pub crawling – with another midnight hotdog – I was going for a healthy breakfast in the morning. 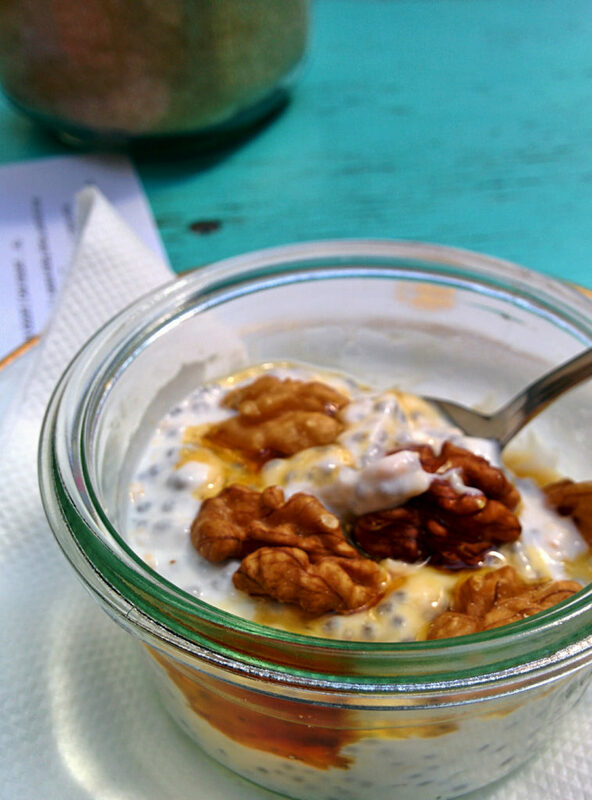 Just some yoghurt with chia seeds, walnut and maple sirup. There’s all kinds of different kinds of goulash in eastern Europe and I simply couldn’t resist the tempting sound of beef cheek Guláš, so that was what I got. It was incredibly tender and dumped in a nice rich gravy, served with a bread dumpling. Obviously accompanied by beer! After a pretty warm and heavy climb up the Petrin hill I went to a Thai restaurant for a little snack. 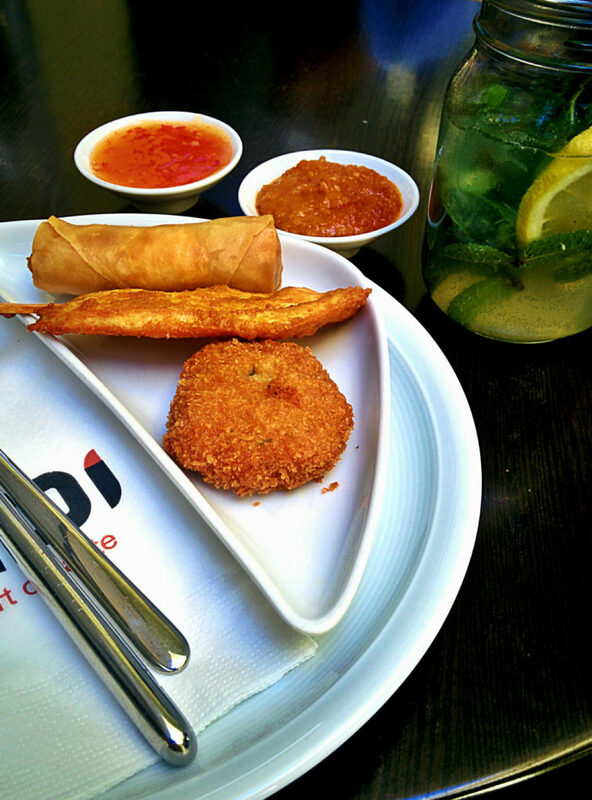 Their mixed starter menu was consisting of an incredibly juicy crab cake, some coconut-milk marinated chicken fillet, as well as a spring roll filled with mihoen noodles. The peanut sauce they had was really good! Guess the second best I ever had. 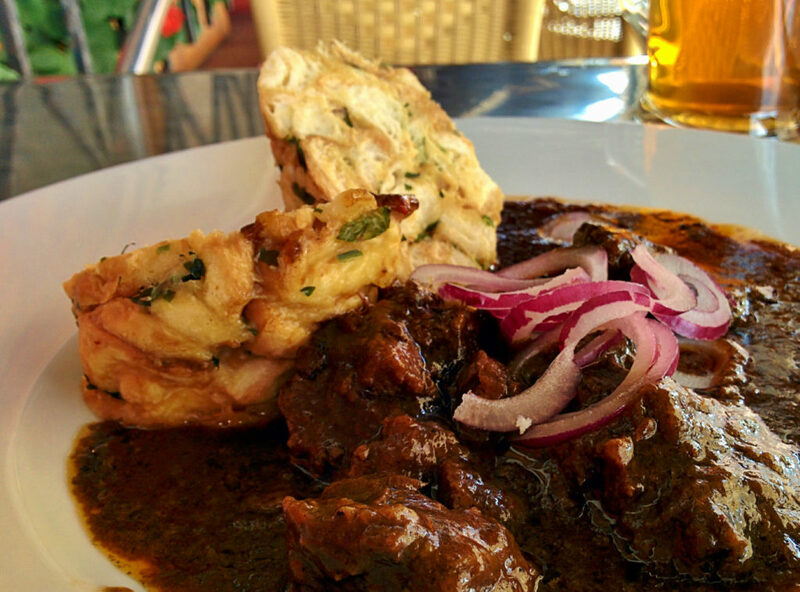 (The best was in a Surinamese restaurant on Curacao – made from scratch, starting by toasting peanuts by hand!). In Prague many restaurant and bars serve homemade lemonade. The one I had here was pretty nice! Main course: Svíčková – Czech pride on a plate! 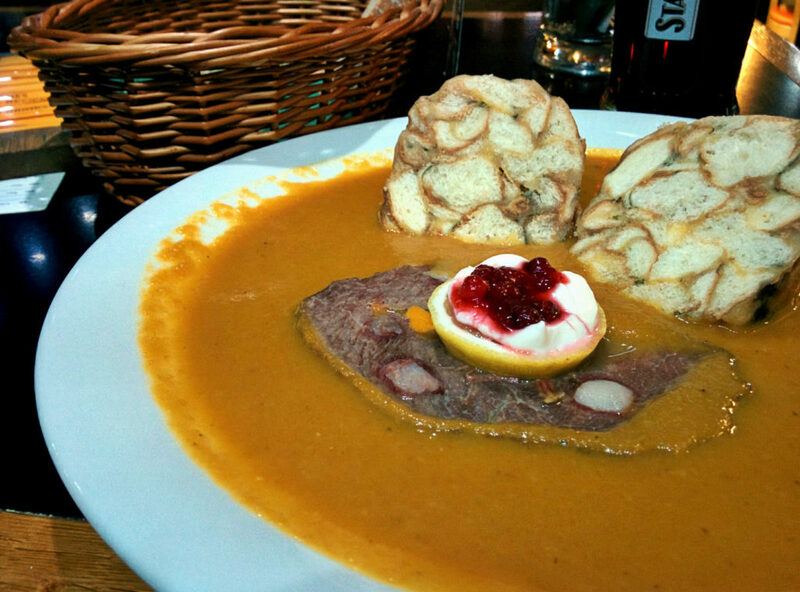 A marinated piece of beef sirloin pierced with some fat in a thick pureed vegetable sauce served with knedlíky (bread dumplings), cranberries, some cream and a slice of lemon. It’s considered the national dish of the county. Rich and delicious! 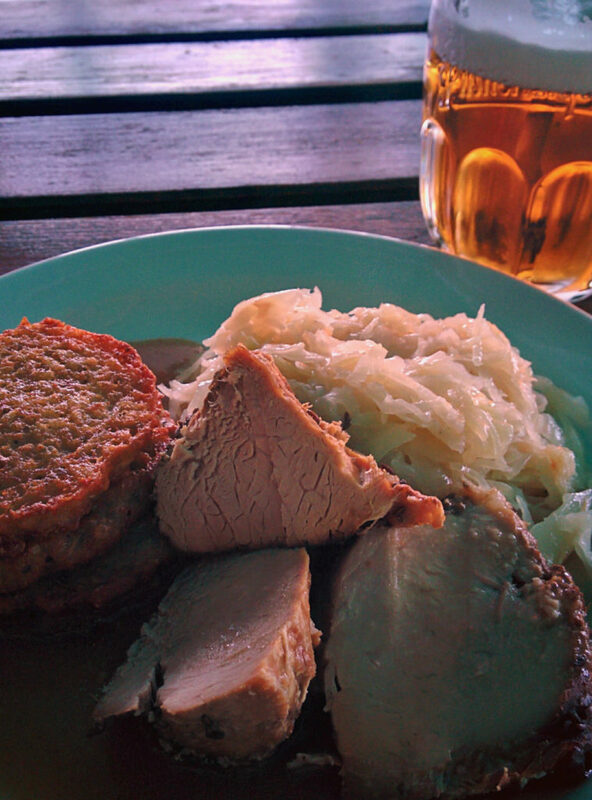 All served in a relaxed restaurant owned by Staropramen – one of Czechs most popular breweries. It honestly can’t get much more Czech than this! Czech pride on a plate! For some nice cultural contrast I went to little Hanoi. I didn’t knew this before, but Czech has quite a big Vietnamese community. So I took the public transport to the very southern outskirts of Prague and ended up in SAPA – a gigantic shopping mall. If you ever wondered where all the cheap fake goods come from – this is the place! Big warehouses, lots of small stalls, everything shrink-wrapped. Watches, phones, toys, shoes, cloths… All fresh out of the container. Need a mannequin with that? Buy one a stall further down! Obviously no photos allowed! If you ever went to the big bazaar in Istanbul – it’s childsplay compared to this! 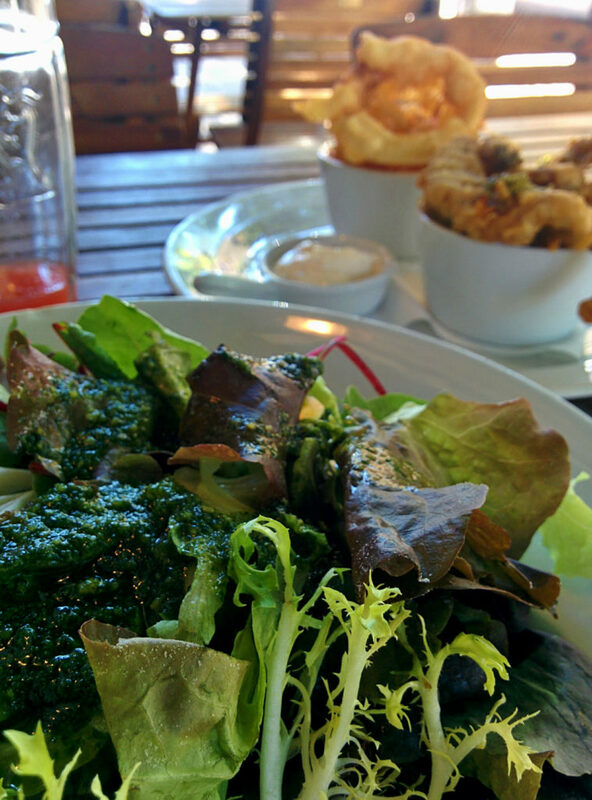 But back to food – I went for the most crowded lunch place I could find. 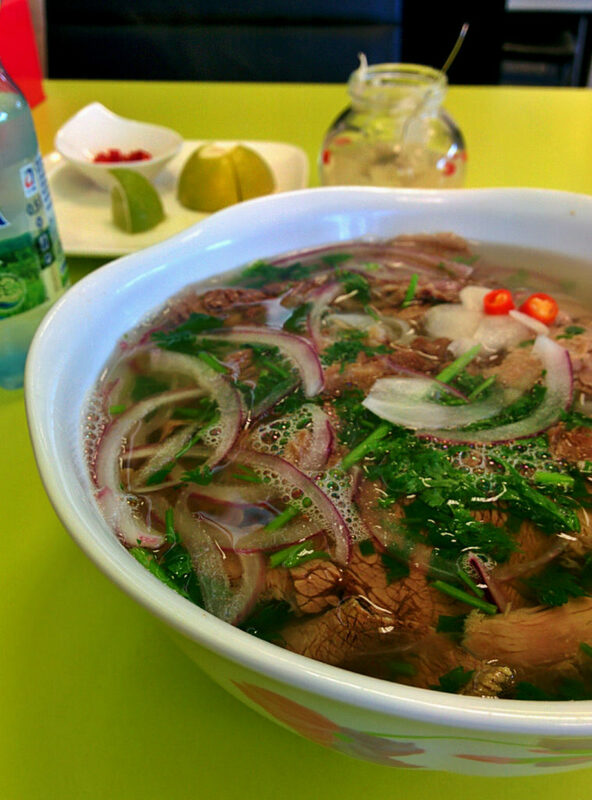 A pho restaurant with only 2 choices – beef or chicken. Sorry vegetarians – I have the feeling you are not really welcome in Prague… Put some pickled garlic on your pho, some bird eye chili and some hotsauce. Boy oh boy, tasty stuff! Beef or chicken? Beef pho! 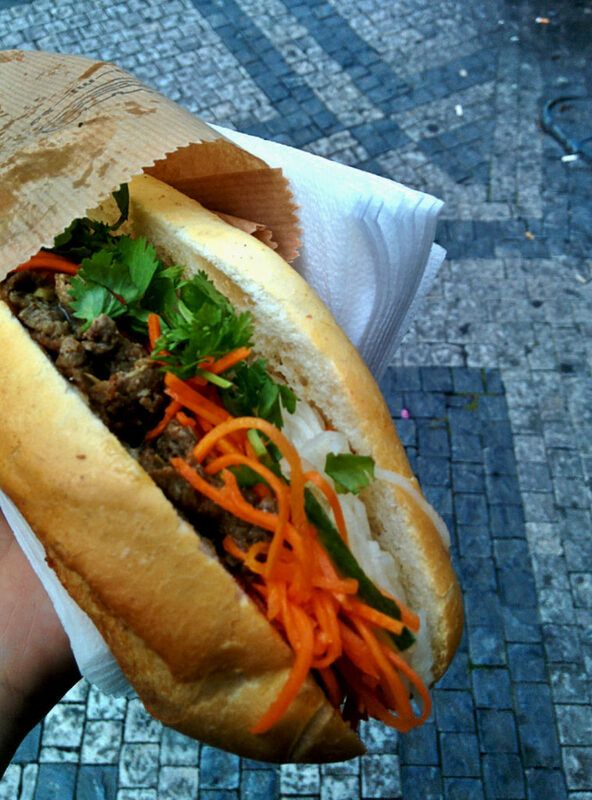 To end my Asian excursion, I finished the day with a Banh mi beef sandwich. Thank you again Vietnamese community! That thing was topped with beef, greens, vermicelli and hot-sauce. Really good! 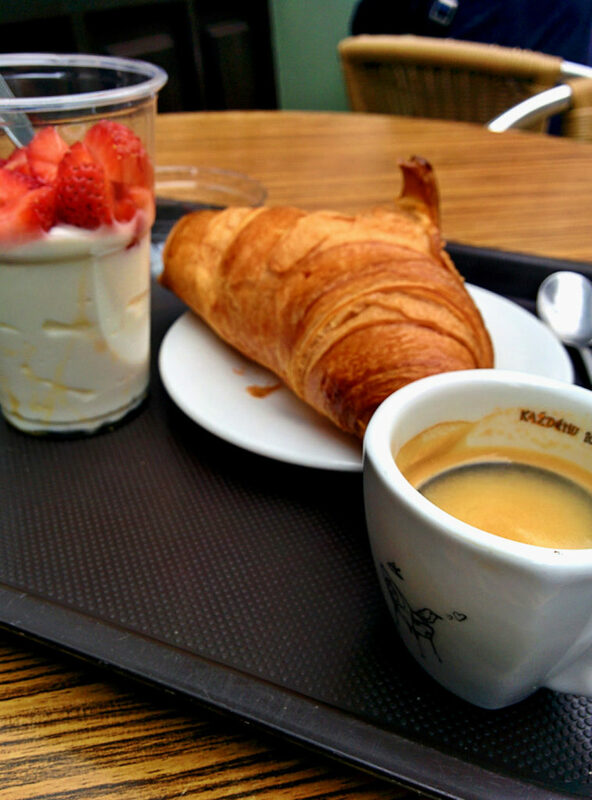 The next day I got some breakfast (Breakfast a croissant with some yoghurt) and went out the very northern outskirts of Prague. 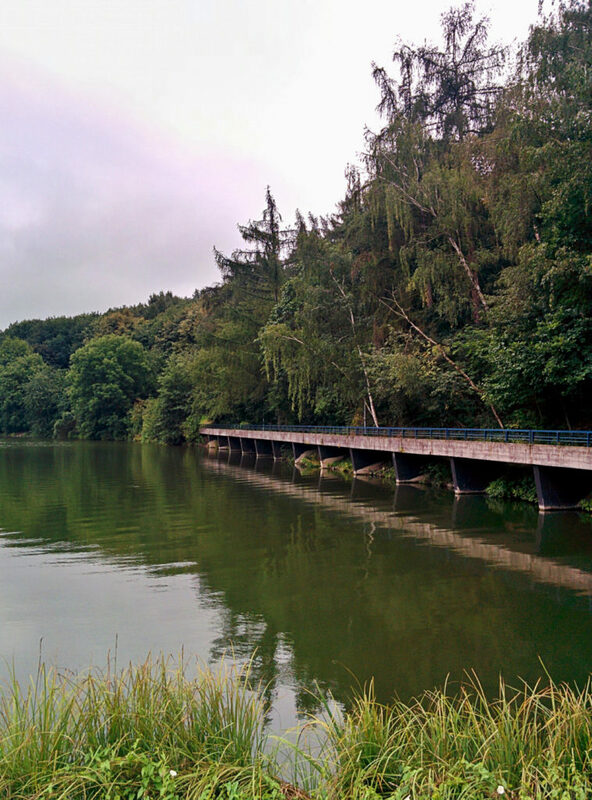 A nature reserve called Divoka Sarka. Every tourist coming from the airport passes it and has no idea. 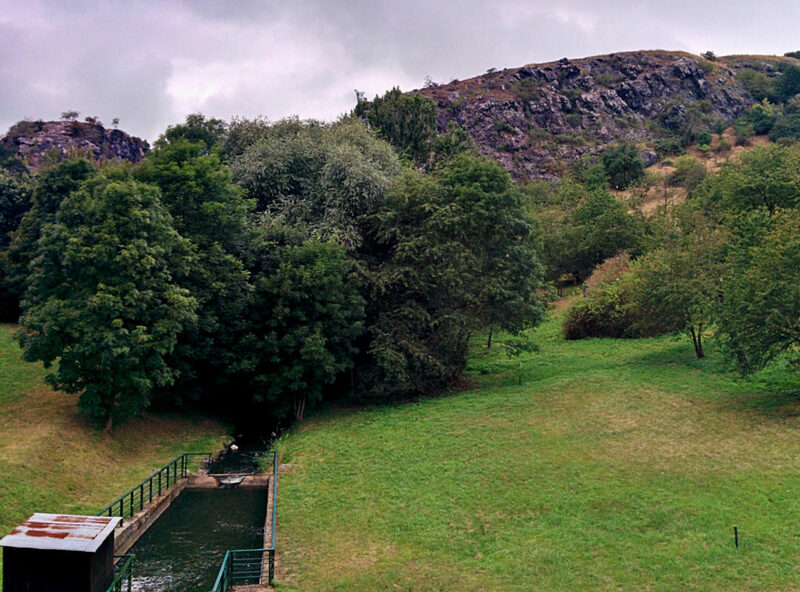 It’s a hidden gem mainly know to the Czech people, with not a single tourist in sight. The nature here is untouched and beautiful! After walking for quite a while I came around a restaurant. English menu? Not here! I asked the waiter and he recommended some roasted pork with potato fritters. The pork was roasted nicely and served with garlicky potato fritters and some stewed cabbage. The cabbage reminded me of the red cabbage (Rotkohl) you get in Germany usually around Christmas time. When I got back from my little hike I went to a local brewery. At the table next to me they had a beer tasting going on. So I listened in and went for the banana they brewed. 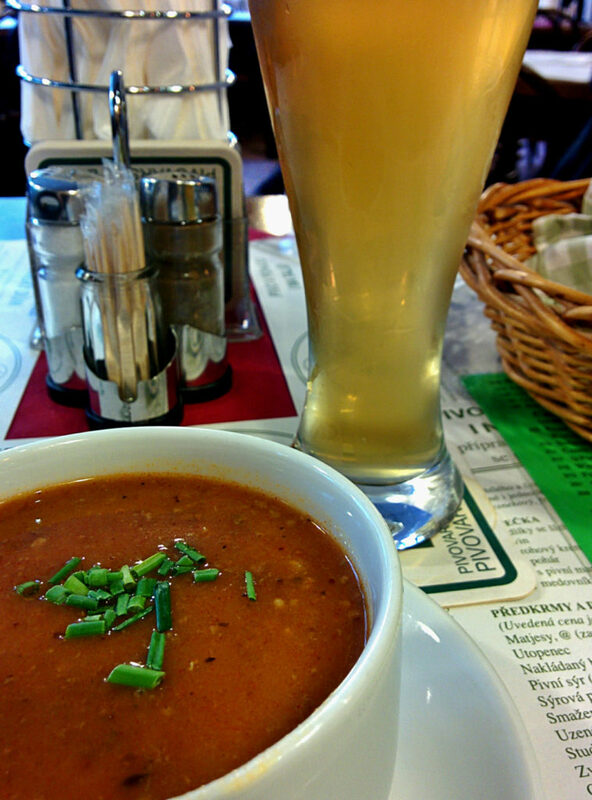 For food I went goulash soup. Even though I was already stuffed I couldn’t resist the sound of sweet fruit filled dumplings. Dough made from potatoes, (kind of like Gnocchi), filled with a blueberry compote, served in cream topped with powdered sugar. Wow! Soo good! This is one of the dishes I will definitely make at home in the near future! At night I went out with some of British folks from my hostel. 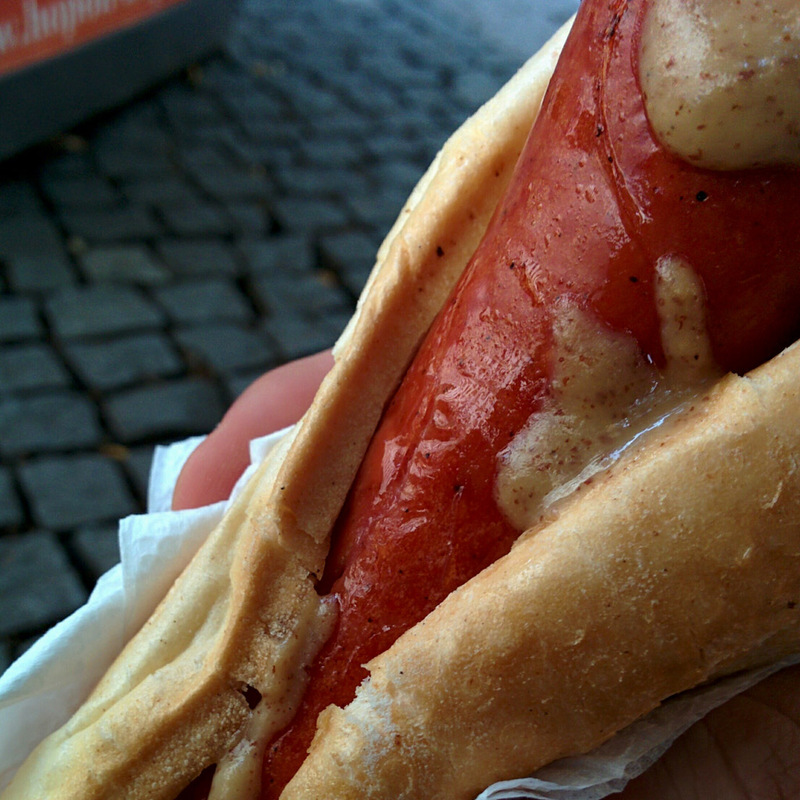 After a night of rather heavy drinking I snuck in another hotdog. What better way to end the night? I saved la piece de resistance for last. 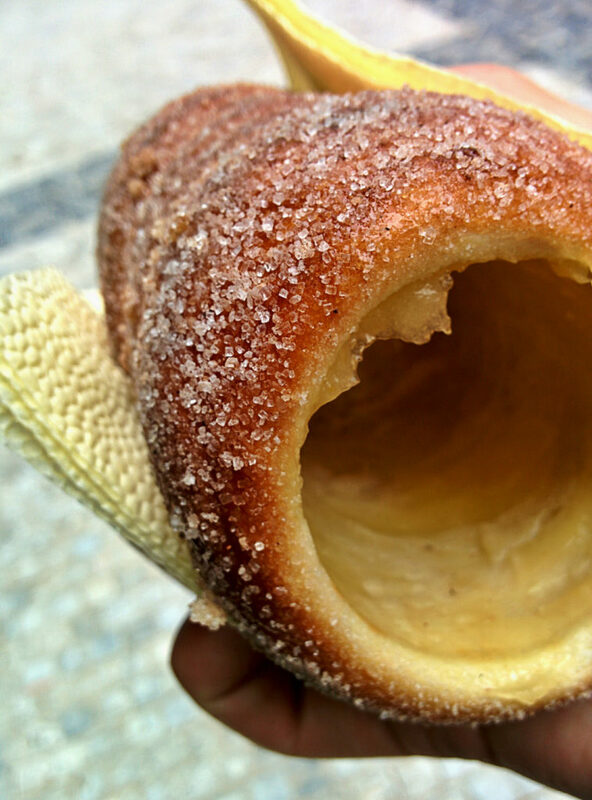 They told me I couldn’t leave Prague without having it: Trdelnik. It’s a dough cone covered in sugar and cinnamon that’s grilled above charcoal. You can get them filled with all kinds of goodies. Even though I was torn between apple-strudel and vanilla sauce, I chose for the latter. A thick vanilla custard that gets slathered on the inside of the cone. Doughy and incredibly sweet! They were right, I would have bailed if I haven’t had ordered this before going to the airport. La piece de resistance! A Trdelnik with vanilla sauce! Thank you Prague for your beautiful city, your hospitality and above all your awesome food! Big chance I’ll be back! PS: With so much food it felt like I gained 10 pounds in just 5 small days… Right after hitting the plane I dropped my bad at home in Amsterdam and went for the gym immediately. Let me know if you enjoyed this post! Would you like to see similar ones in the future or should I better just stick to the recipes?